-Made available a finding aid to assist researchers in using the collection. -Scanned and created metadata for almost 5,500 collection items in the Lowcountry Digital Library . -Cataloged over 300 published materials, including books, serials, pamphlets, and art portfolios. 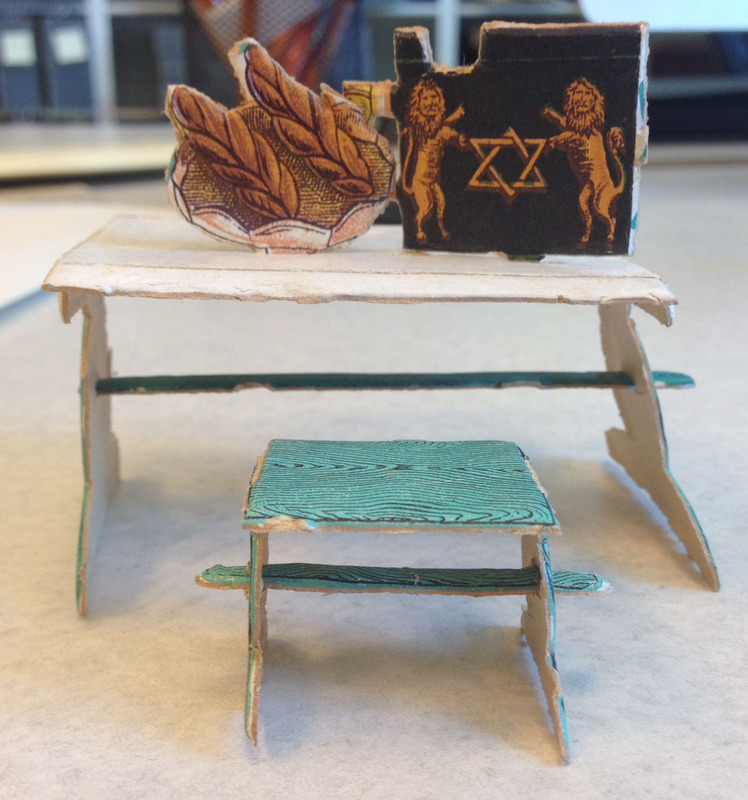 -Curated an online exhibit based on the collection’s strength of imagery centered on the synagogue. 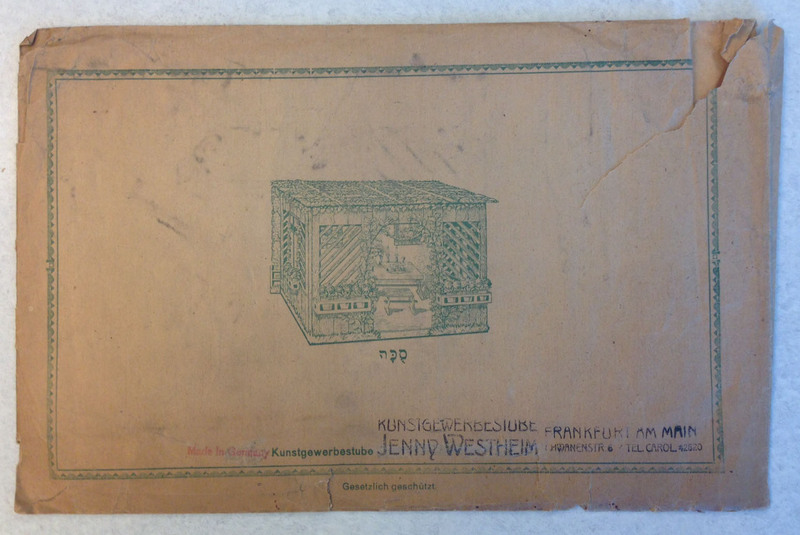 Please contact Manager of Research Services Mary Jo Fairchild with any questions regarding the William A. Rosenthall Judaica Collection. 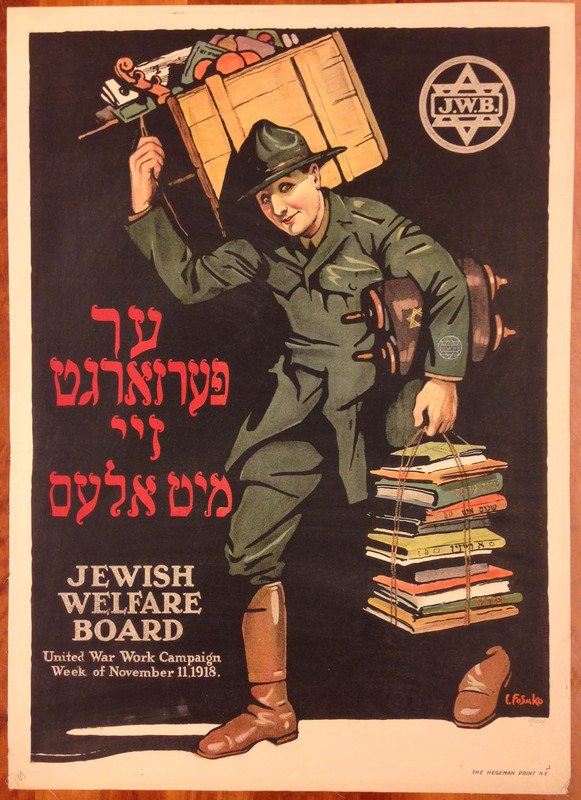 The Lowcountry Digital Library has made available 725 additional prints from the William A. Rosenthall Judaica Collection. 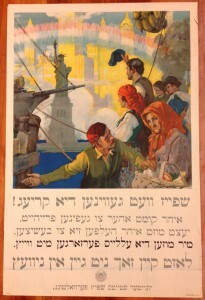 These prints come from portfolios covering the topics of synagogues (Germany, Italy, United States), ceremonies (life cycle and synagogal), ceremonies (calendrical and special), places (walls, ghettos, buildings), costumes (Africa), costumes (Moses, priests, ritual), portraits, cemeteries, and German-language caricatures. Below, a sampling of the prints from these portfolios. 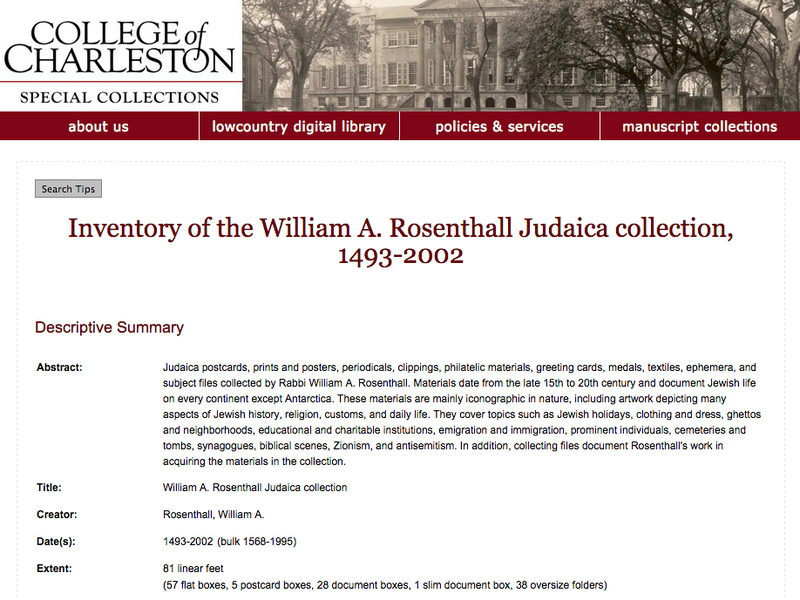 To see all digitized prints, search the Lowcountry Digital Library: William A. Rosenthall Judaica Collection – Prints and Photographs. Interior of the Hamburg Temple (Israelitischer Tempel) in the Poolstraße, which was inaugurated on September 5, 1844. Exterior of the Neue Synagoge (New Synagogue) in Hannover. 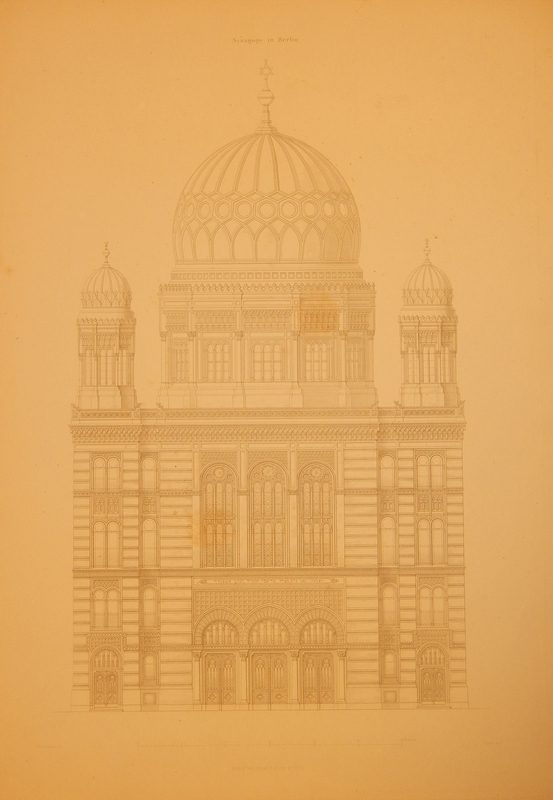 Interior of the former location of Temple Emanu-El at 5th Avenue and 43rd Street in New York. Mole Antonelliana in Turin. The structure was originally conceived as a synagogue. 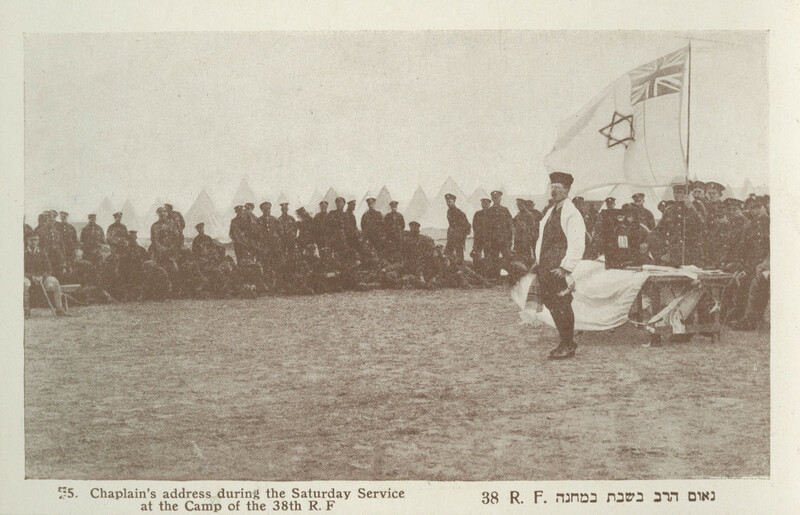 A boy during his bar mitzvah ceremony. From the article “The Jews in America” by Alfred Trumble, published in the August 1877 edition of Frank Leslie’s Popular Monthly. Marriage ceremony of Alphonse James de Rothschild and Leonora de Rothschild. 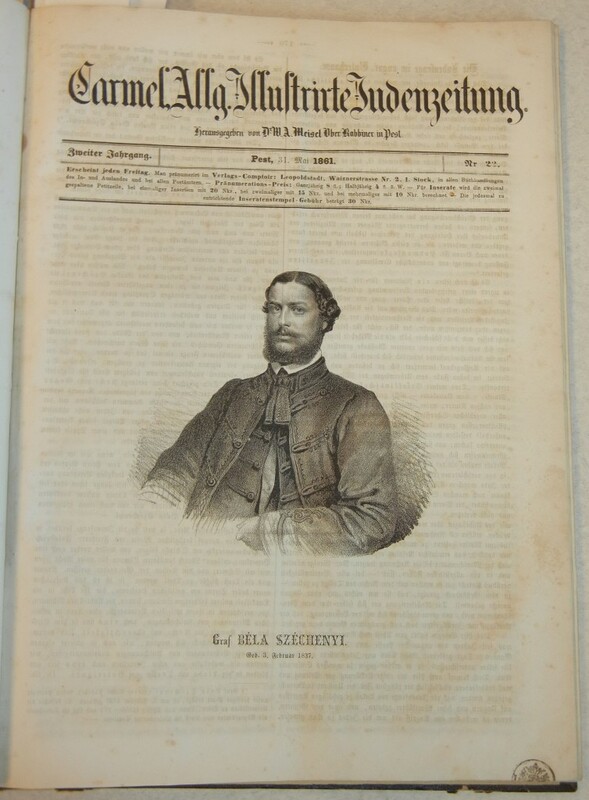 Published in the March 14, 1857, edition of The Illustrated London News. Jewish divorce. Etching by Jan Luyken. From Kerk-zeeden ende gewoonten die huiden in gebruik zijn onder de jooden by Leon Modena, published Amsterdam: Timotheus ten Hoorn. Yom Kippur in the Portuguese Synagogue in Amsterdam. Engraving by Abraham Jacobsz. Hulk after a drawing by Abraham Pietersz. Hulk. From Oude en tegenwoordige staat en geschiedenis van alle godsdiensten, Volume 1, by William Hurd, published Amsterdam: M. de Bruyn, 1781-1791. Ceremony of Havdalah. From the article “The Jews in New York–II” by Richard Wheatley, published in the February 1892 edition of The Century Magazine. 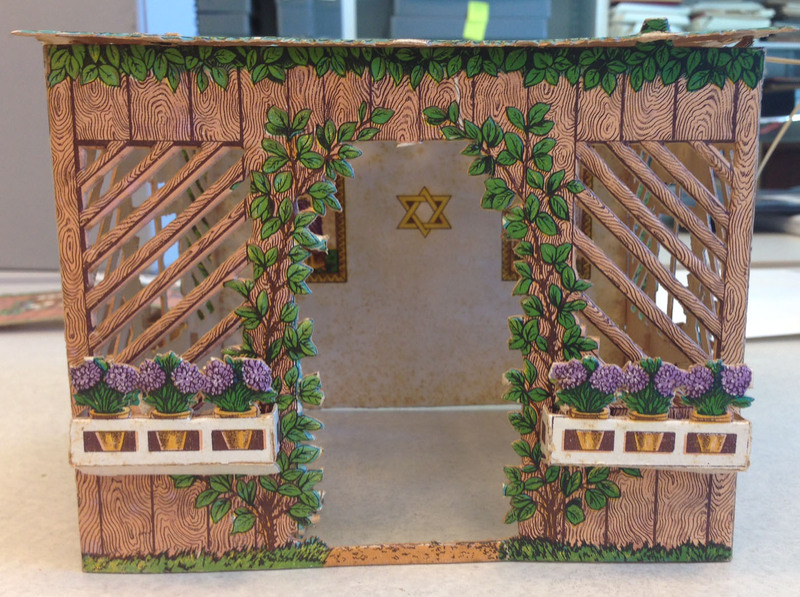 Sukkot in the synagogue. With Hebrew text of Leviticus 23:40 : “And ye shall take you on the first day the fruit of goodly trees, branches of palm-trees, and boughs of thick trees, and willows of the brook, and ye shall rejoice before the Lord your God seven days.” Frontispiece to Maḥazor le-ḥag ha-Sukot ule-shabat she-betokho : ke-minhag Ashkenaz : meduyaḳ heṭev u-mevoʼar yafeh u-meturgam Ashkenazit, published Sulzbach: Buchdruckerey von S. Arnstein & Sohne. The priestly blessing on Yom Kippur. 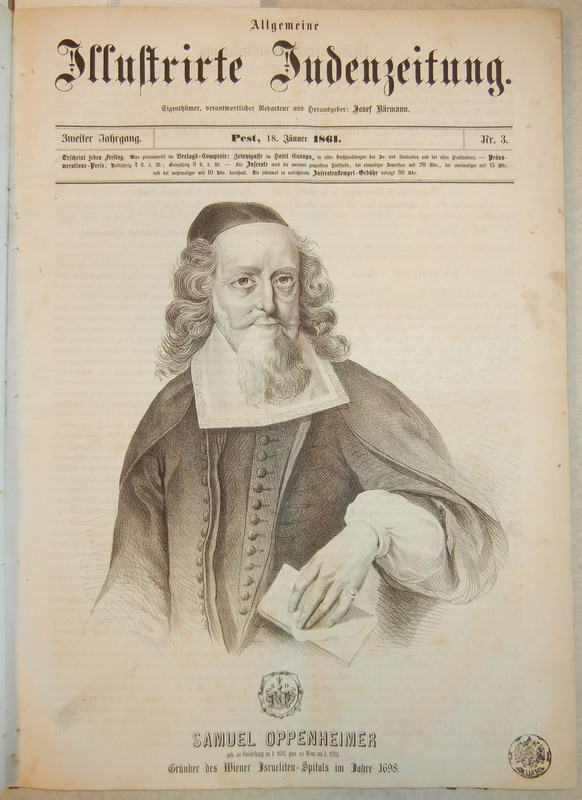 From Libellus de Judaica confessione by Johannes Pfefferkorn, published Cologne: Johannes Landen. Lighting a menorah on Hanukkah. From Philologus hebræo-mixtus by Johannes Leusden, published Ultrajecti : ex officinâ Francisci Halma. Western Wall in Jerusalem. 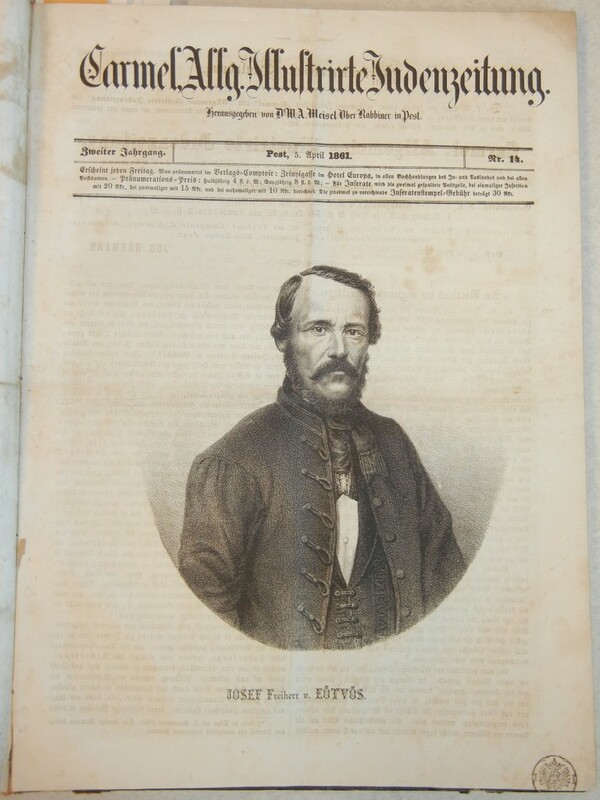 Etching signed by the artist Henri Le Riche. Judenplatz in Vienna. 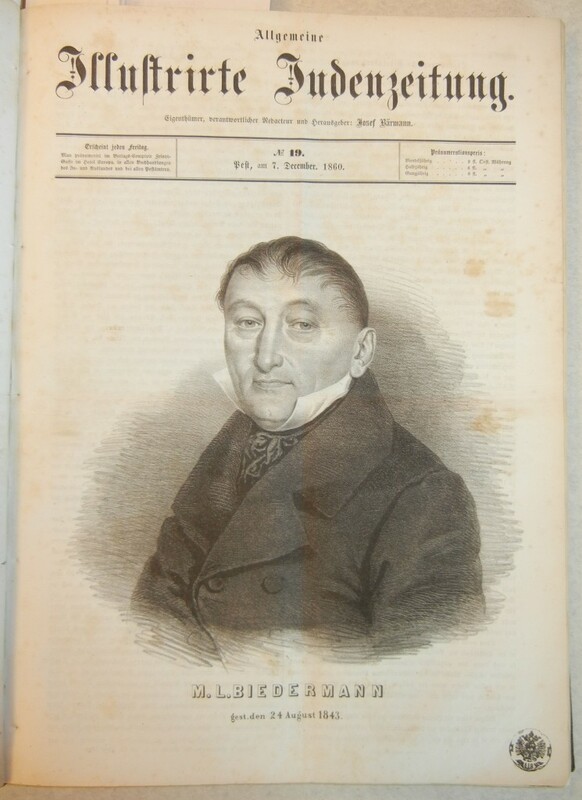 Engraving by Johann Wenzel Zinke after Salomon Kleiner. 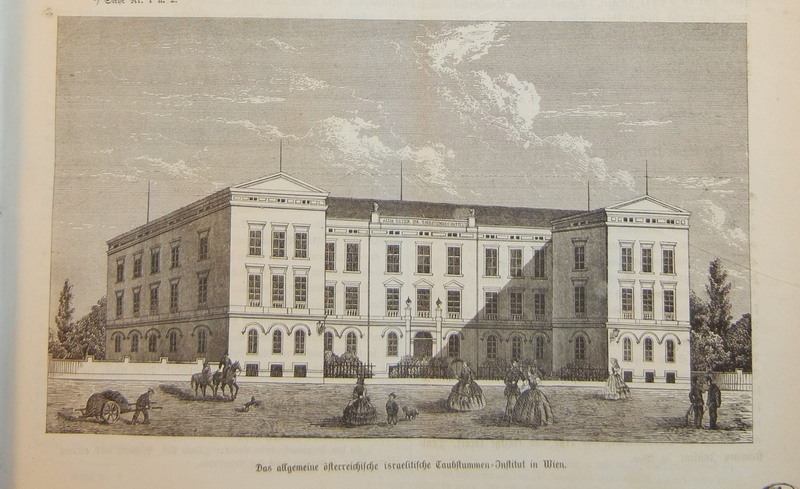 Printed Vienna: F. Bauer. Jewish quarter of Tétouan. Etching signed by the artist James McBey. Israelitisches Krankenhaus Hamburg. Drawn, printed, and published Hamburg: Peter Suhr. 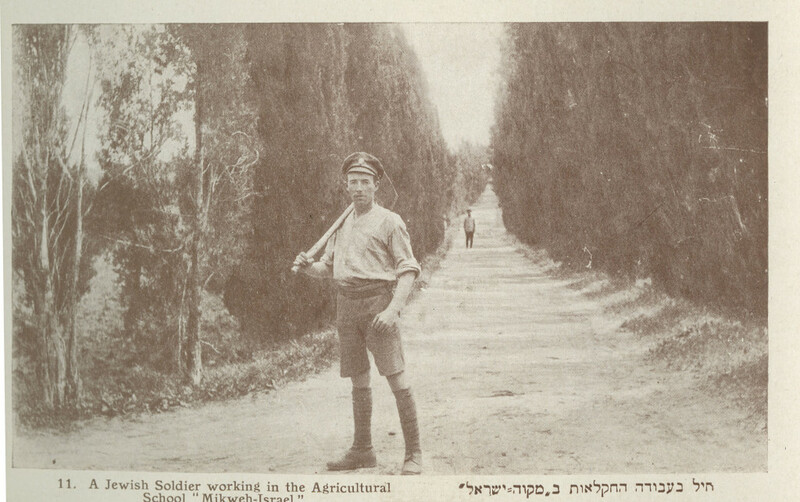 Jewish merchant from Algeria. Engraving by Monnin after Francois Claudius Compte-Calix. From Musée cosmopolite, published Paris: Ancienne Mon Aubert. Jewish children from Algeria. Illustration by Louis Lassalle. 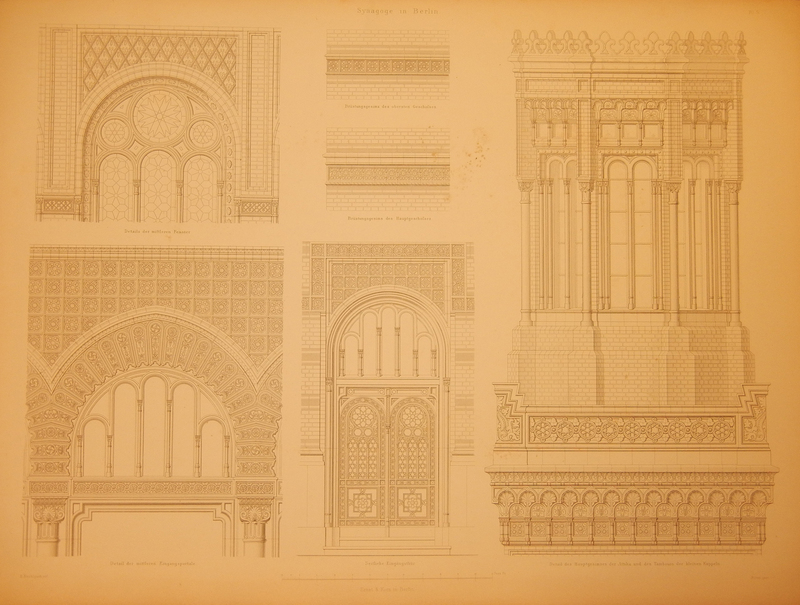 Lithograph printed Paris: J. Rigo et Cie. From L’Algérie de la jeunesse by Christian Pitois, published Paris : Alph. Desesserts. Married Jewish woman from Algeria. Wood engraving by Léopold Deghouy after Théodore Frère. 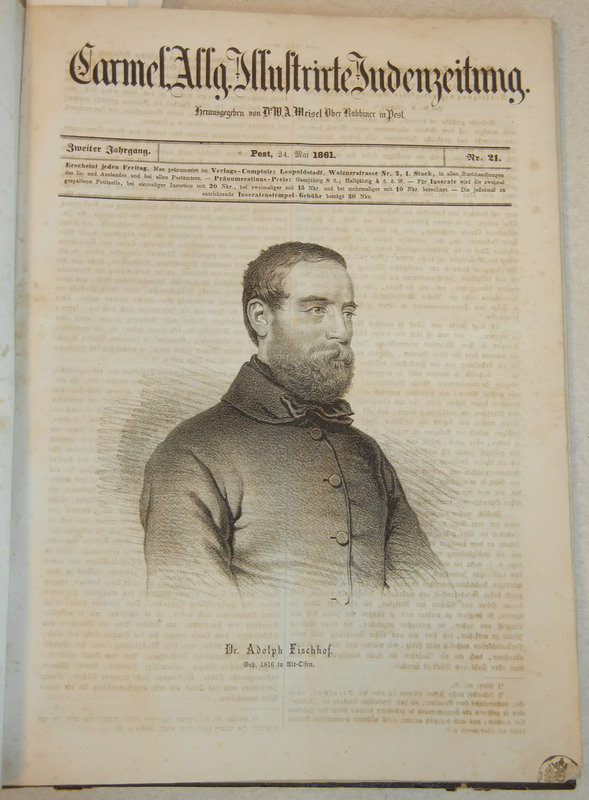 From L’Afrique française by Christian Pitois, published Paris: A. Barbier. Jewish woman from Algiers. 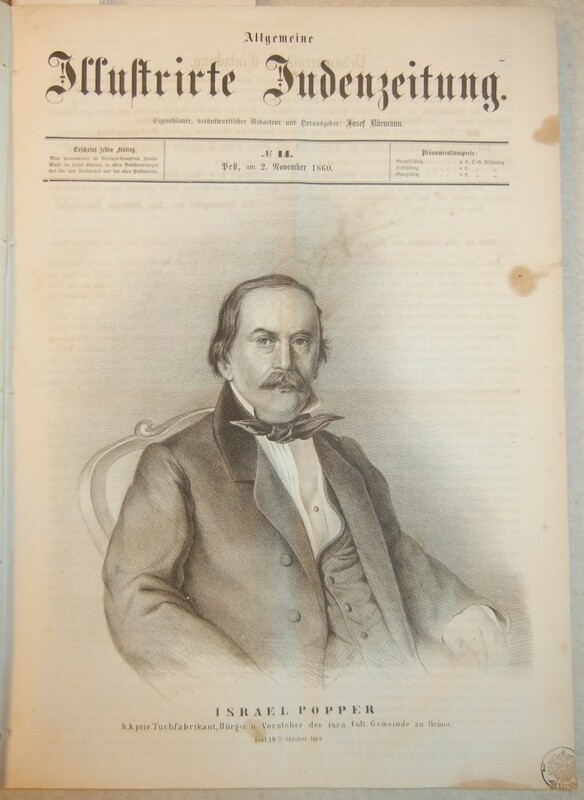 Wood engraving by Pierre Verdeil after Hippolyte Louis Emile Pauquet. 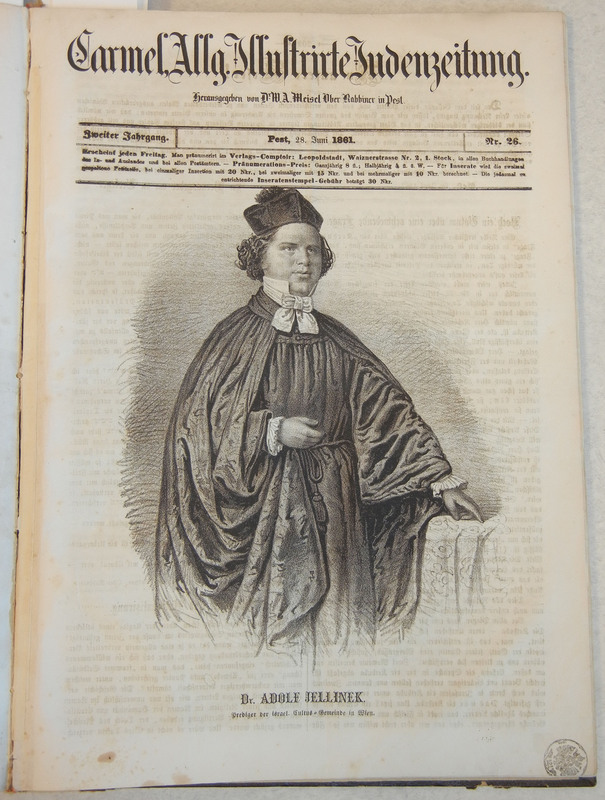 Published in Les Français peints par eux-mêmes, Volume 3. Jewish women from Oran. 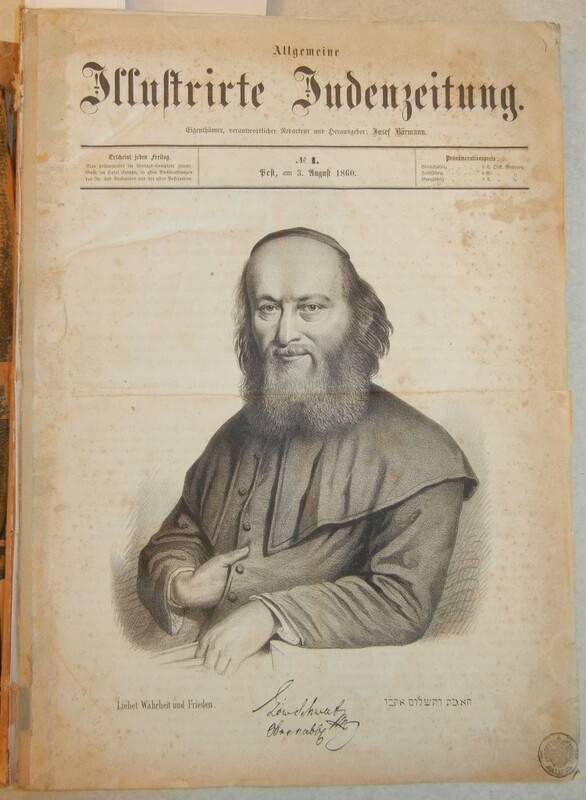 Lithograph by E. de Laguerenne. From L’Art en province, published Moulins: P.-A. Desrosiers. 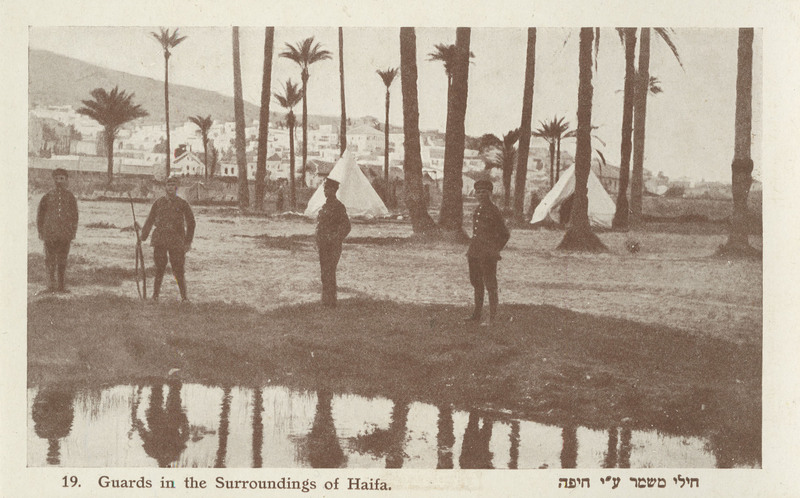 Jews from Tunis. Engraving by Edouard Willmann after Emile Rouargue. From La Méditerranée, ses îles et ses bords by Louis Enault, published Paris: Morizot. Moses and the Ten Commandments. Mezzotint by Elias Christoph Heiss after Johann Jakob von Sandrart. Frontispiece to Biblia Ectypa : Bildnußen auß Heiliger Schrifft deß Alt- und Neuen Testaments by Christoph Weigel, published Augsburg: Weigel. Moses receiving the Ten Commandments. 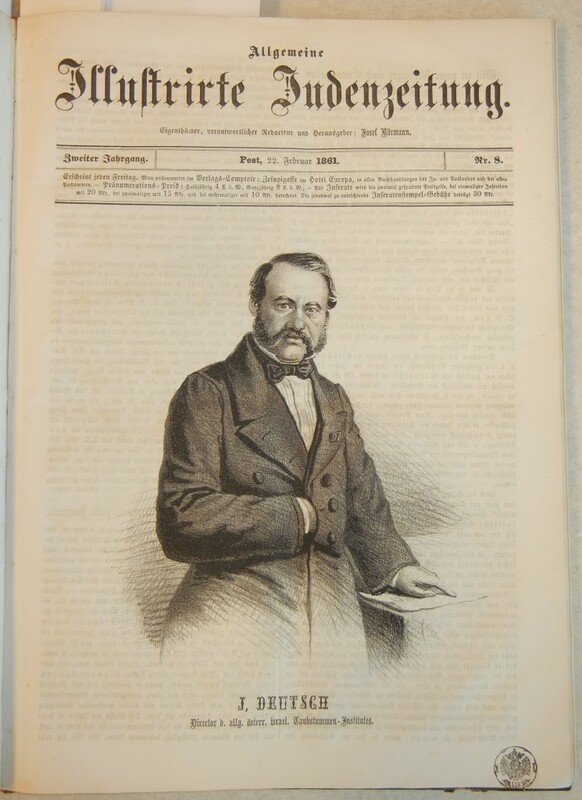 Wood engraving by Richard Julius Jungtow after Julius Schnorr von Carolsfeld. From Die Bibel in Bildern : 240 Darstellungen, erfunden und auf Holz gezeichnet von Julius Schnorr von Carolsfeld, published Leipzig: Wigand. Wood engraving by Howard Simon depicting Moses holding out his staff and the Israelites crossing the Red Sea. Vestments of the Jewish high priest. Engraving by Johann Carl Joseph Störcklin. From Biblia, das ist: die gantze Heilige Schrifft Alten und Neuen Testaments, translated by Martin Luther, published Basel: Thurneysen. Saul before the Jewish high priest. Engraving by Giovanni Bigatti. 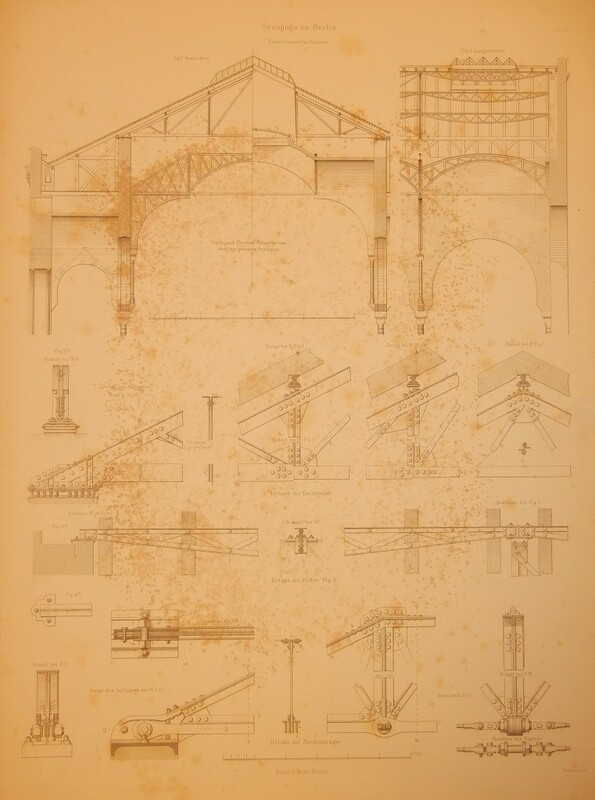 From Le Costume ancien et moderne, ou, Histoire du gouvernement, de la milice, de la religion, des arts, sciences et usages de tous les peuples anciens et modernes, Asia, Volume 3, by Giulio Ferrario, published Milan: De l’imprimerie de l’editeur, 1815-1829. Vestments of a Jewish high priest. From Tableau historique des costumes, des moeurs et des usages des principaux peuples de l’antiquité et du moyen age, Volume 2, by Robert von Spalart, published Metz: Collignon. Portraits of 40 rabbis throughout Jewish history, with a larger, central image of Maimonides. 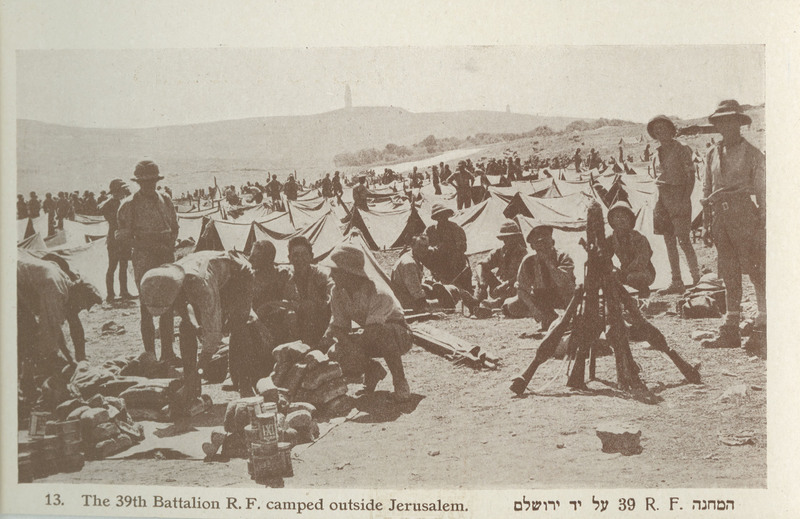 Includes Samuel Edels, Isaac ben Jacob Alfasi, Isaac Abravanel,the Maggid of Kozhnitz, the Vilna Gaon, Moses Sofer, Akiva Eger, Jonathan Eybeschütz, David Nieto, Dov Berush Meisels, Meir Leibush, Shimon Sofer, Mordecai Banet, Abraham Tiktin, Yechezkel Landau, and others. Scenes from the execution by hanging of financier Joseph Süß Oppenheimer: his exit from Stuttgart under armed guard, above, and his hanging outside the city, below. Josephus (born Joseph ben Matityahu). 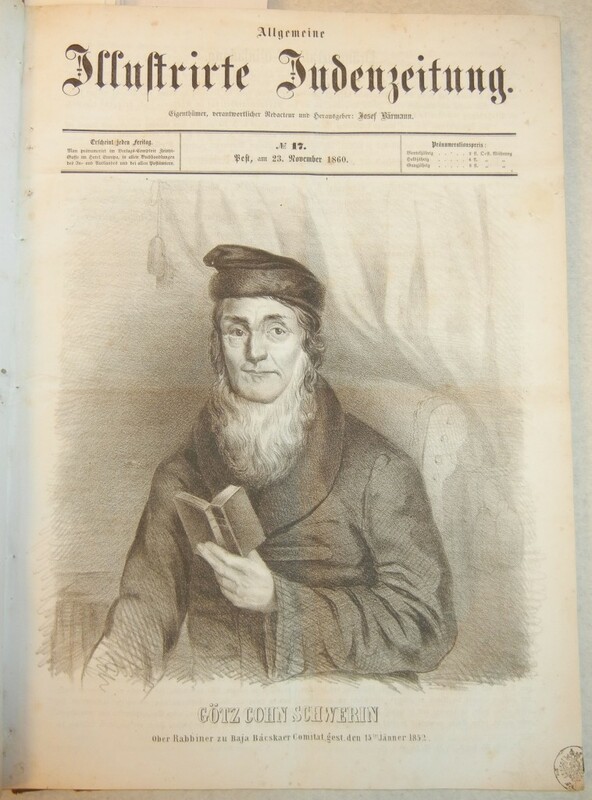 Jewish peddler Mordechai Löb (1745-1817) of Schlüchtern, known as the “Preusje von Schlüchtern. 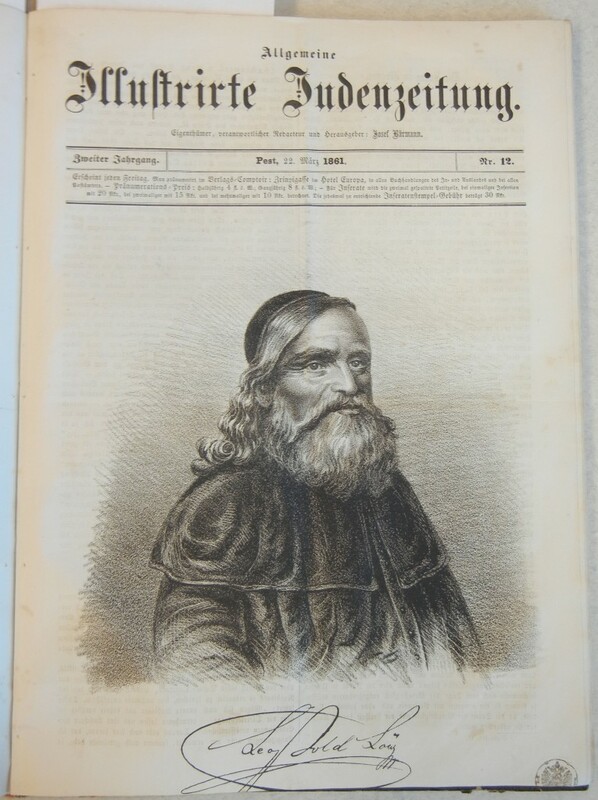 Chief Rabbi Maier Zipser (1815-1869). Tomb of Absalom, Tomb of Benei Hezir, and Tomb of Zechariah in the Valley of Jehoshaphat (Kidron Valley) in Jerusalem. Tombs of the Sanhedrin in Jerusalem. Tomb of Zechariah in the Valley of Jehoshaphat (Kidron Valley) in Jerusalem. Old Jewish Cemetery in Frankfurt am Main. 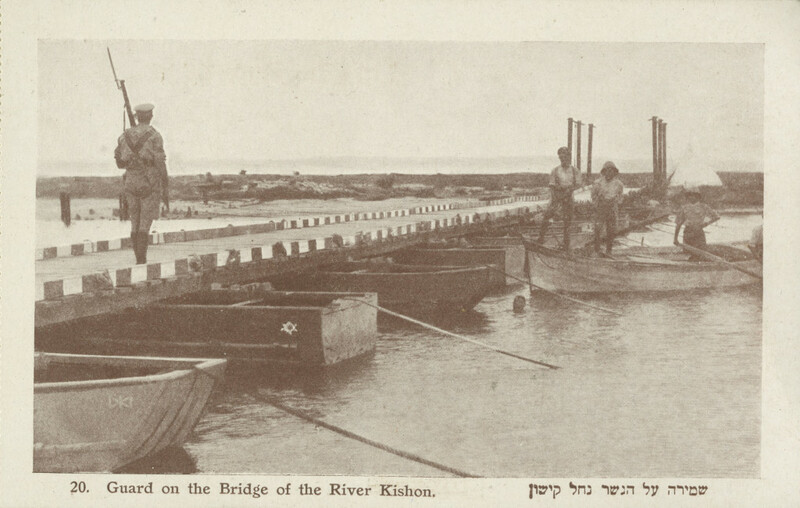 The Lowcountry Digital Library has made available 705 additional postcards from the William A. Rosenthall Judaica Collection. 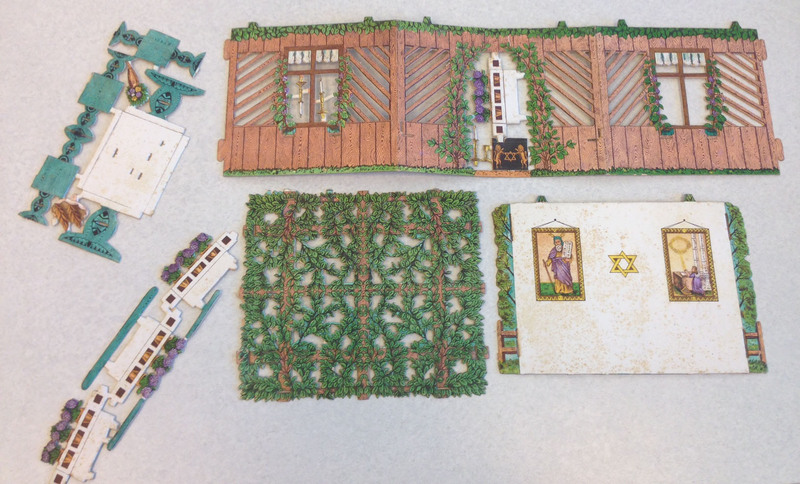 These postcards come from three portfolios covering the topics of Jewish authors and artists, rabbis and political leaders, and folk art. Below, a sampling of the postcards from these portfolios. 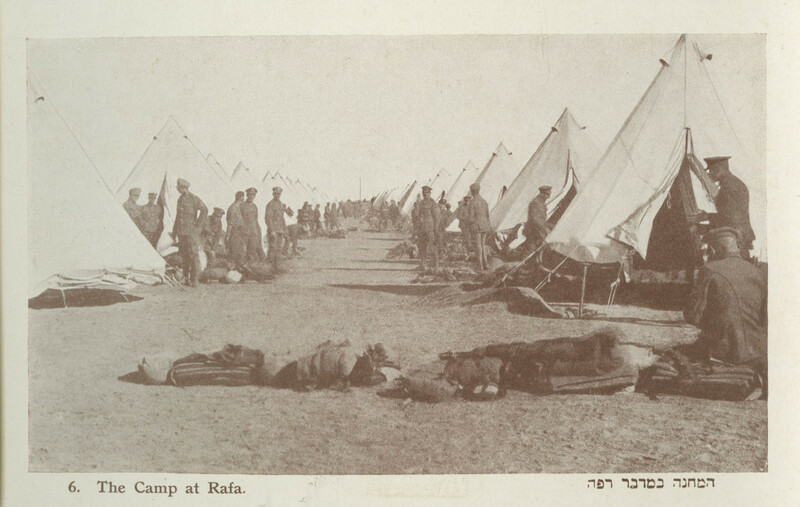 To see all digitized postcards, search the Lowcountry Digital Library: William A. Rosenthall Judaica Collection – Postcards. Poet, editor, and critic Ya’akov Fichmann. Poet and novelist Zalman Shneour. Author and literary critic Isidor [Yisroel] Eliashev (pen name Bal-Makhshoves). Poet and essayist Menahem Boraisha. Editors of socialist and radical newspapers and journals in the United States. Yiddish authors at the Czernowitz Conference, 1908. 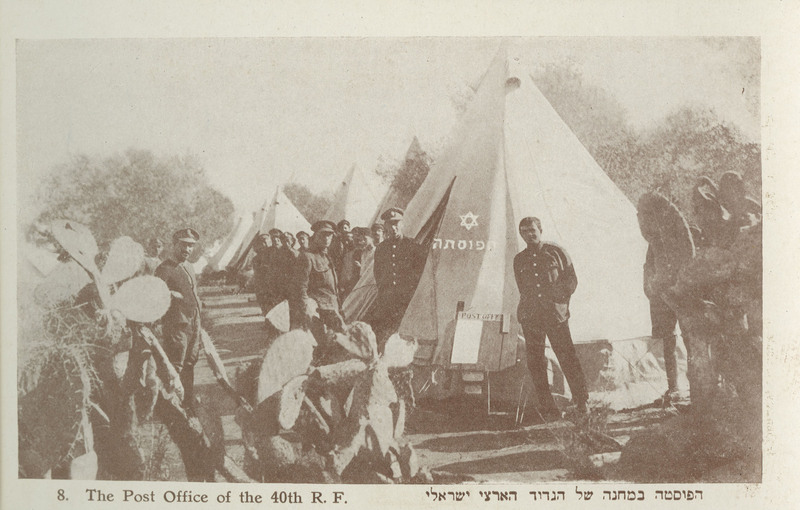 From left to right : Avrom Reyzen, Yitskhok Leybush Peretz (I. L. Peretz), Sholem Asch, Khayim Zhitlovski, and Hersh Dovid Nomberg. Alfred Dreyfus and his defenders: Bernard Lazare, Fernand Labori, Georges Picquart, and Auguste Scheurer-Kestner. Mendel Beilis and his defenders during his trial for ritual murder: Oskar Osipovich Gruzenberg, Vasily Maklakov, Nikolai Platonovich Karabchevsky, Alexander Zarudny, and Dmitry Grigorovich-Barsky. Chief Rabbi Joseph Hermann Hertz, Chief Rabbi of the United Hebrew Congregations of the Commonwealth. Rabbi Hayyim Moshe Bejerano, Chief Rabbi of Turkey. 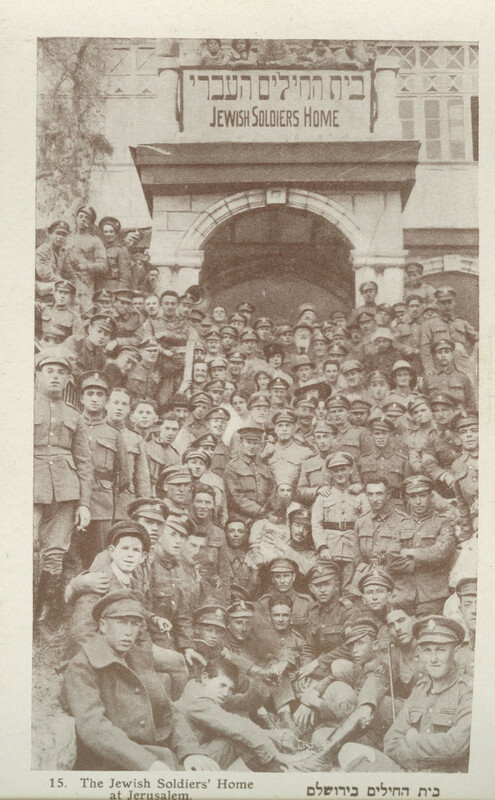 Chaplains in the Germany Army during World War I, including Jewish chaplain Rabbi Jacob Sonderling. 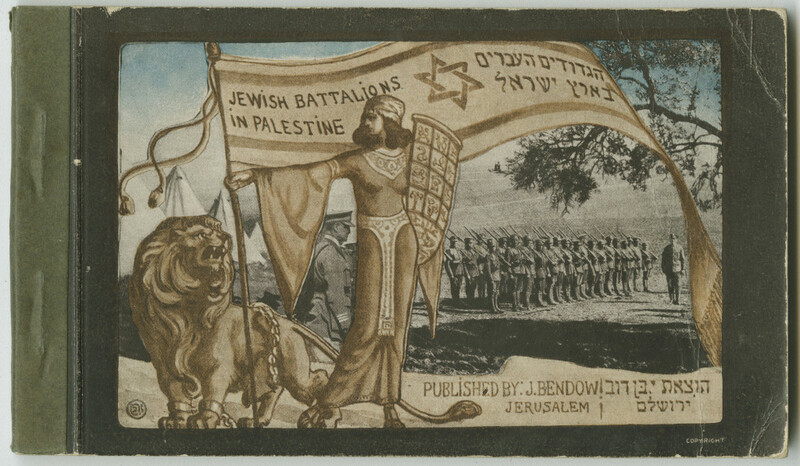 Design of the Jewish National Fund’s commemorative Theodor Herzl stamp, featuring Herzl looking toward the Tower of David in Jerusalem, as Jewish pioneers march to work below. Arthur Balfour’s reception at the electrical power station in Tel Aviv during his 1925 visit to Palestine. 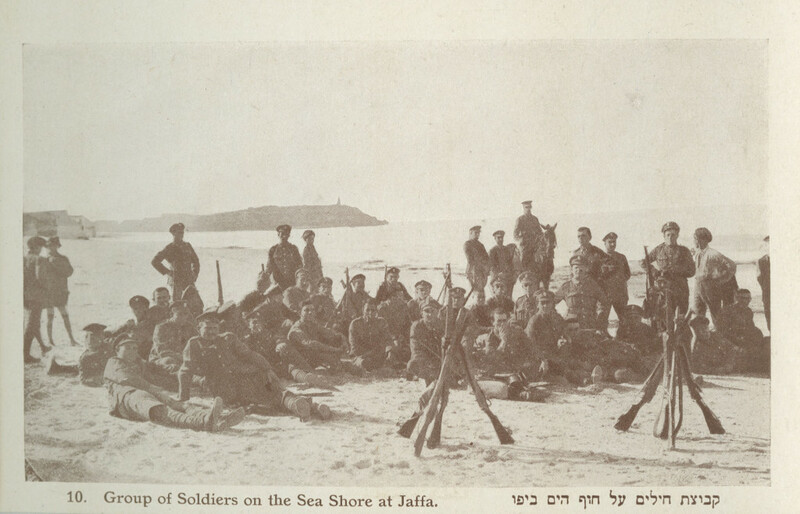 Balfour (fourth from right); to his right, Pinhas Rutenberg. 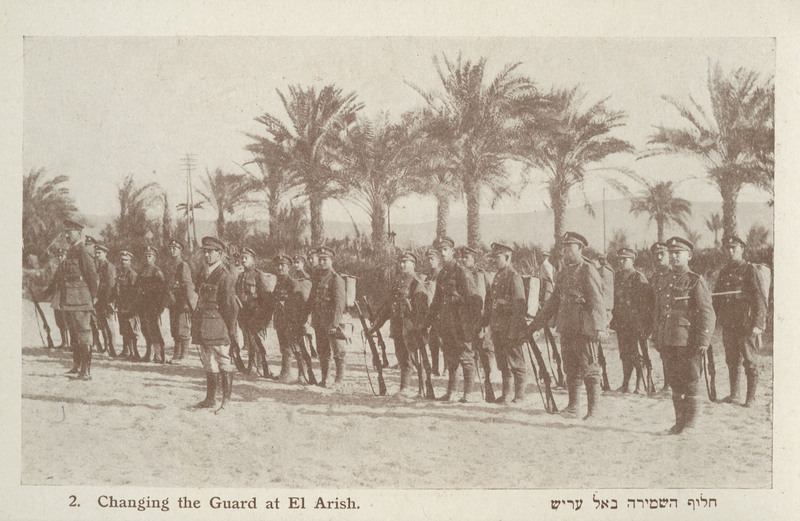 Meir Dizengoff stands second from right. Rabbi Ben-Zion Meir Hai Uziel addressing the first meeting of the Assembly of Representatives on October 7, 1920, in Jerusalem. 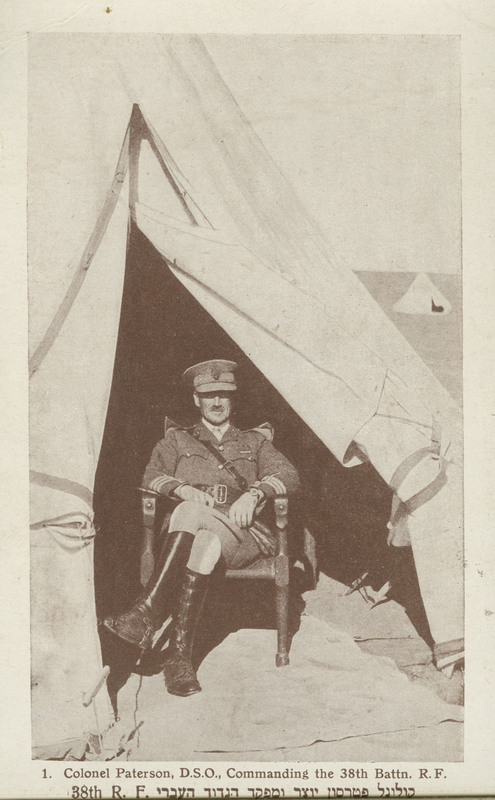 Yitsḥak Grünbaum, first Interior Minister of Israel. Yekusiel Portnoy (1872–1941) (pseudonym Noyekh), leader of the Bund in Poland. Blowing the shofar on Rosh Hashanah. Entering the synagogue. 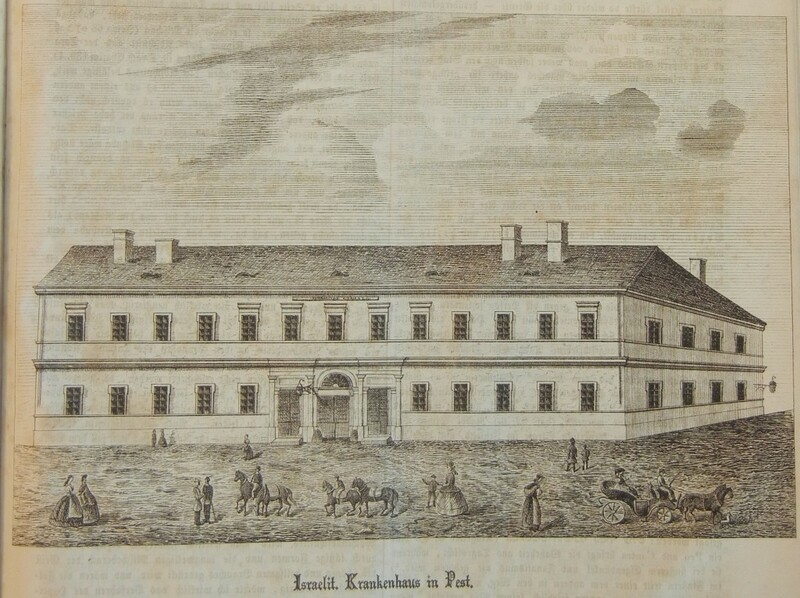 Original illustration by Friedrich Kaskeline. The ceremony of tashlikh. The Brooklyn Bridge can be seen in the background. Mayim achronim (hand washing) before Birkat Hamazon. 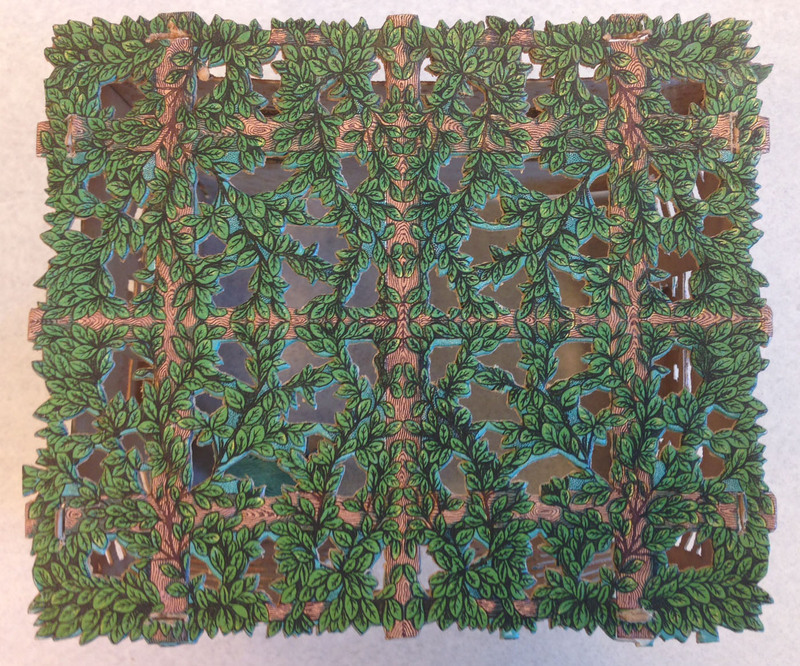 Original illustration by Jacob Keller. Taking the Torah scroll out of the Torah ark. Original illustration by S. Seeberger. As the Rosenthall project draws to a close, we are thrilled to be able to announce two significant collection resources. The finding aid for the William A. Rosenthall Judaica Collection is now available to researchers online. The finding aid provides a comprehensive overview of the many formats and topics included in this collection, as well as materials documenting Rosenthall’s collecting efforts. 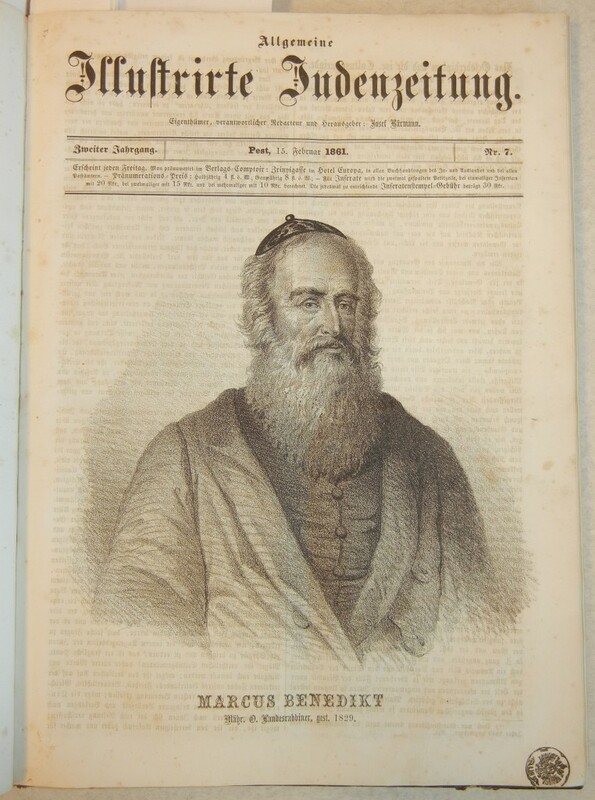 We are also thrilled to announce the launch of the online exhibit The Life of the Synagogue, a tribute to both the central role of the synagogue in Jewish life and the man whose passion for collecting made this exhibit possible. 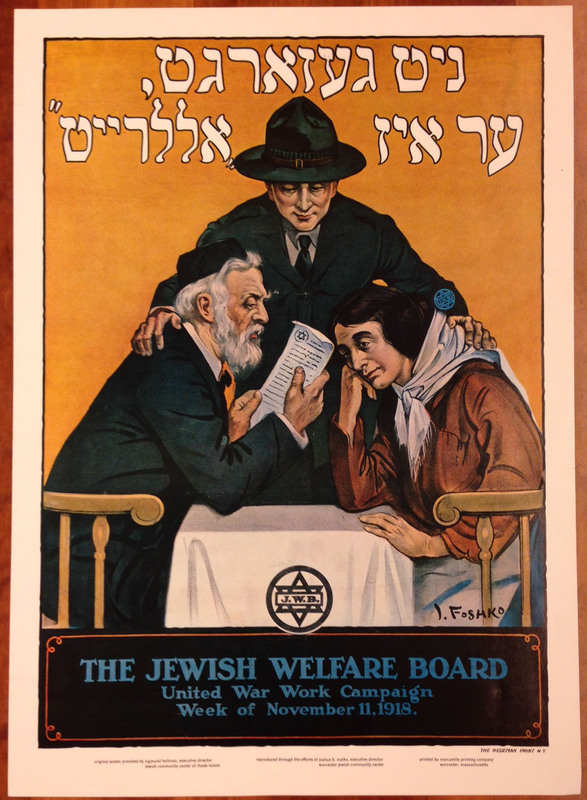 Curated by Samuel D. Gruber, Sarah Glover, and Amy Lazarus, the exhibit contains 76 items selected from the William A. Rosenthall Judaica Collection at the College of Charleston, one of the largest accessible collections of imagery related to synagogues and other aspects of Jewish life and culture around the world. 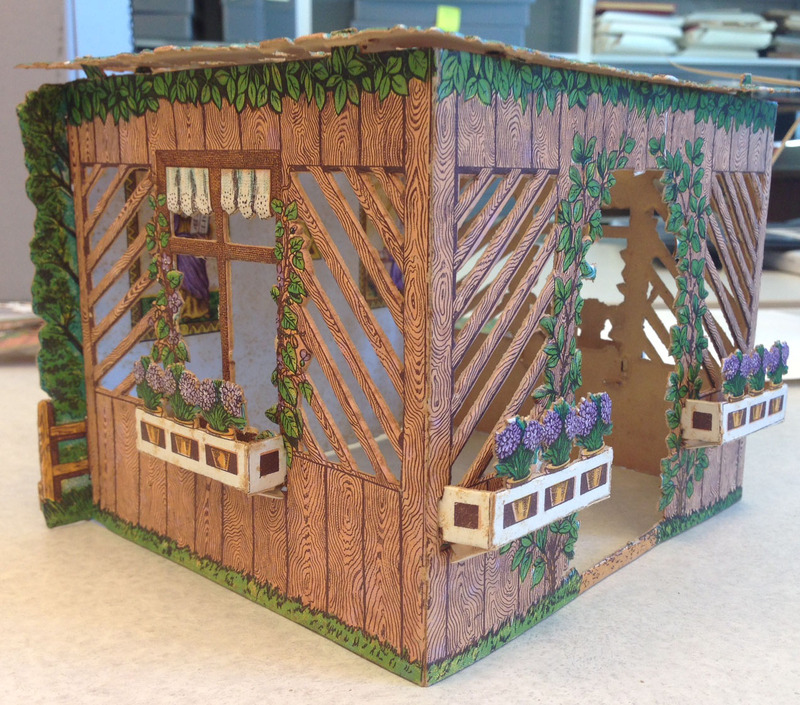 The exhibit is divided into nine sections, exploring topics ranging from synagogue building and dedications to the celebration of life cycle events and festivals to the varied contributions of women. 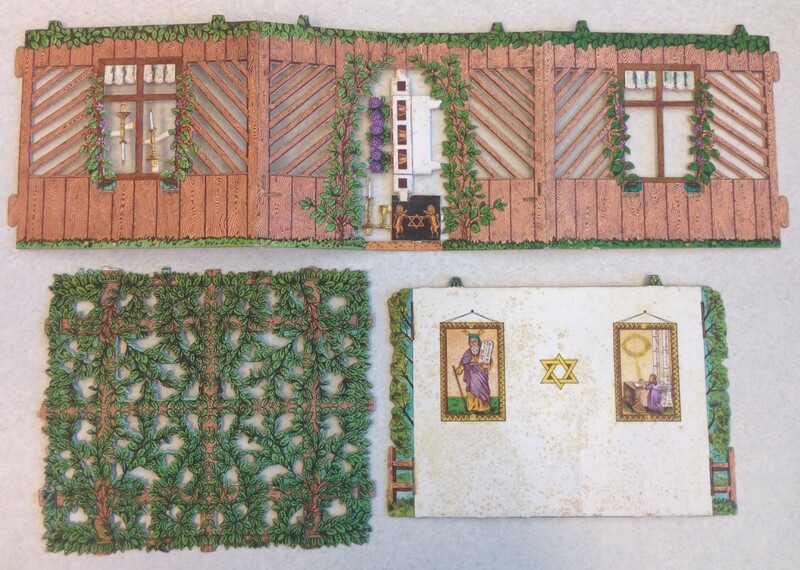 These images offer a broad understanding of the history of synagogue architecture and design, in addition to shedding light on the lives, customs, and religious practices of the people within the four walls of the synagogue. 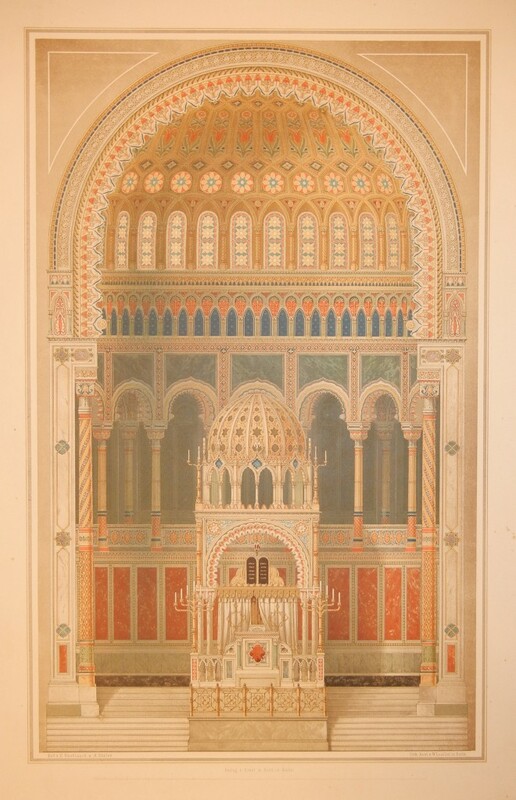 A major focus of the William A. Rosenthall Judaica Collection is synagogue imagery represented in both prints and postcards. 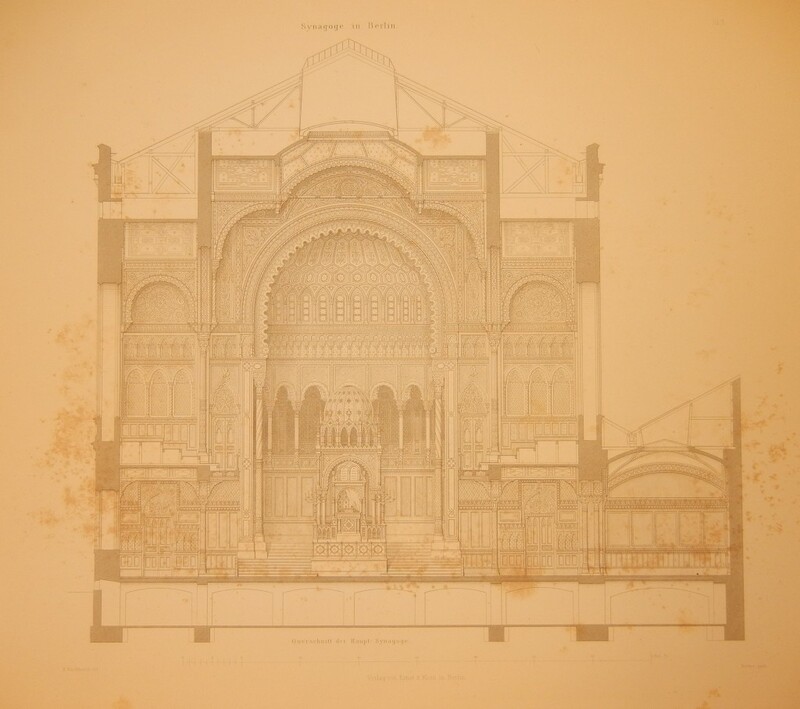 In addition to thousands of such items, dozens of books collected by Rosenthall explore the art and architecture of the synagogue. 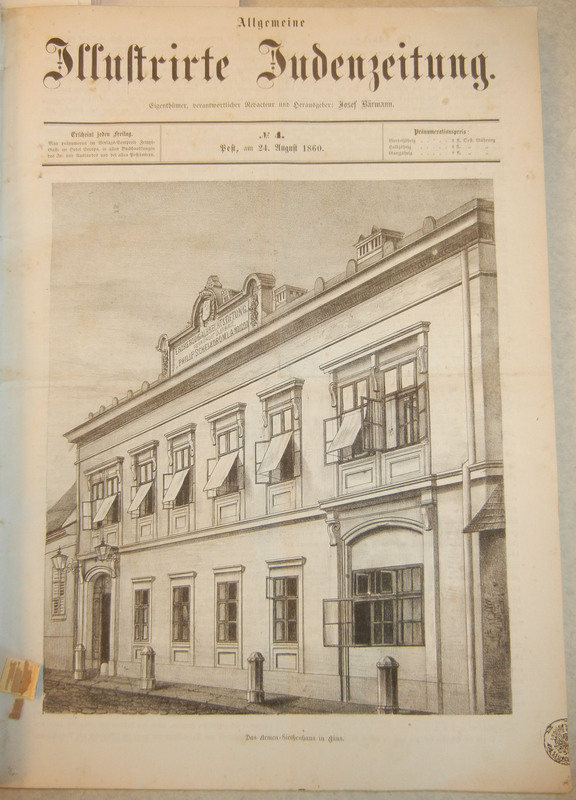 Such items include publications on specific synagogues, such as Bevis Marks in London, the Alte Synagoge in Essen, and the Pinkas Synagogue in Prague; on synagogues in defined geographic areas, such as Baden-Württemberg, Vienna, Amsterdam, and Italy; and on synagogue art and architecture. 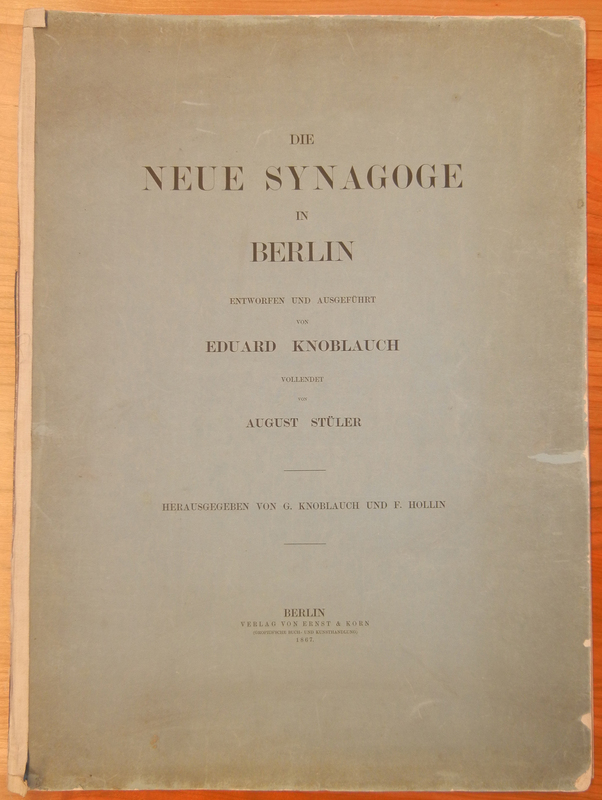 One of the publications that most spectacularly combines imagery and text is Die neue Synagoge in Berlin : entworfen und ausgeführt von Eduard Knoblauch, vollendet von August Stüler, published in Berlin in 1867. 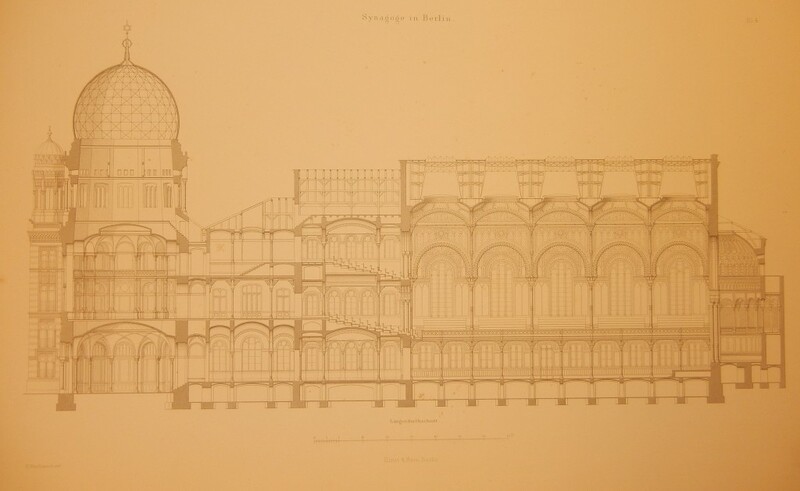 The New Synagogue in Berlin, Germany, was designed by architect Eduard Knoblauch; following the architect’s death, the structure was completed by architect August Stüler. 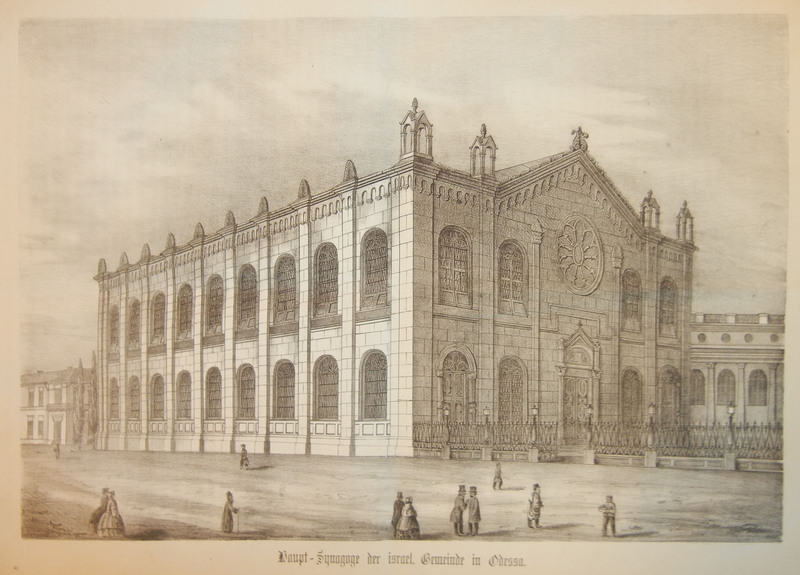 The synagogue was inaugurated on September 5, 1886. 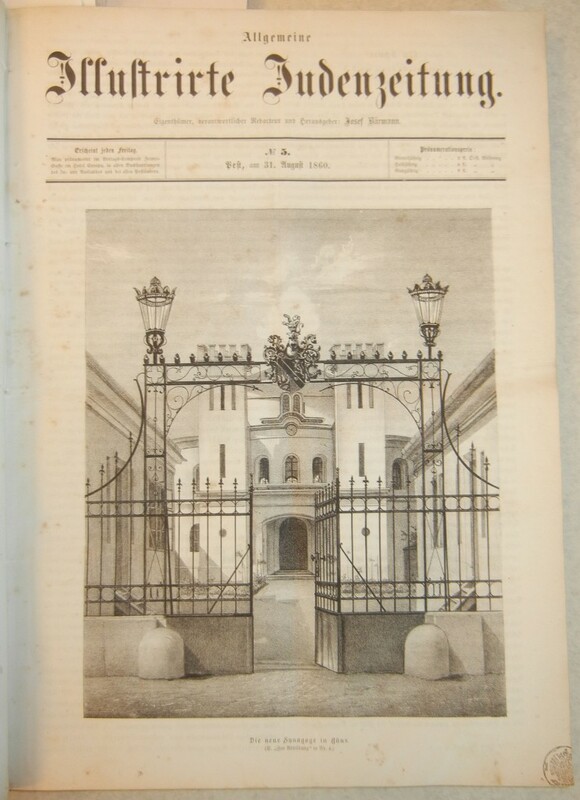 This publication includes an introduction by Eduard Knoblauch’s son Gustav Knoblauch, which details the history of the building’s construction and explicates the layout of the complex, as well as one full-page chromolithograph of the synagogue’s interior and and six full-page engravings of plans for the structure. 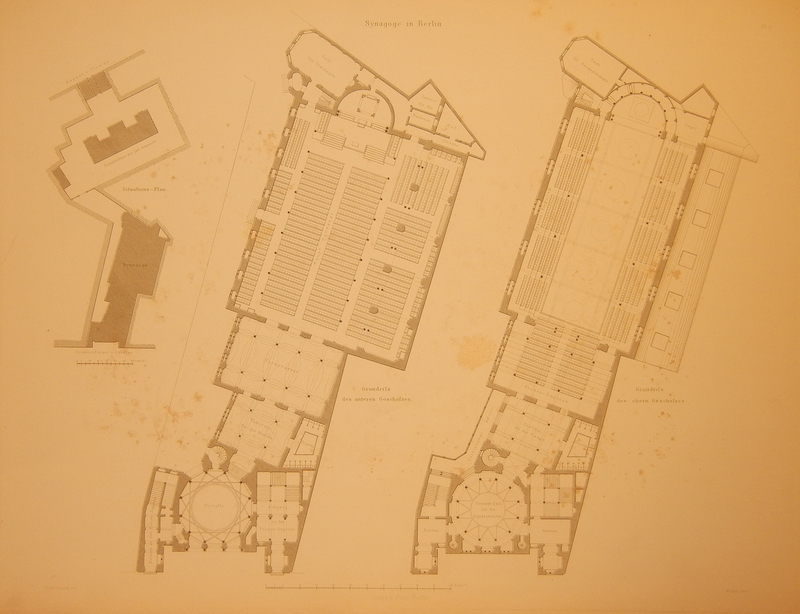 Floor plans for the upper and lower levels. The upper level is labeled as the women’s gallery; the placement of the organ is also noted. Men would sit on the lower level, but the plans for this level also include stairs for the women to use to enter their gallery. A smaller diagram to the left shows the synagogue’s proximity to Berlin’s Jewish Hospital.